My mom knows about pie. She knows that it’s ok to use 8 cups of peaches instead of 5, and she didn’t judge me for not having a pastry blender. She also said that it’s ok if a pie is juicy and doesn’t slice as pretty as you’d hope. “Just serve it in a bowl,” she says. So there you go. We went to Eastern Market Saturday morning to get all those Michigan peaches up there. 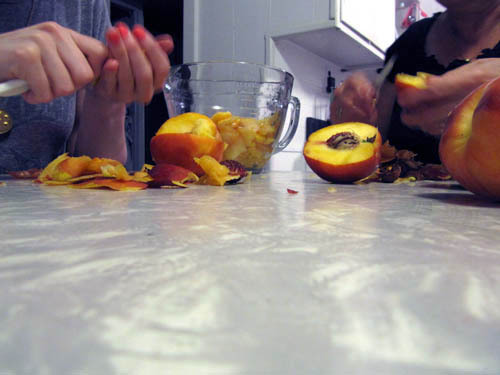 We squeezed a lot of peaches to ensure that they were pie-ready. My mom has skills. Either that, or the peaches she sliced were much softer than mine. 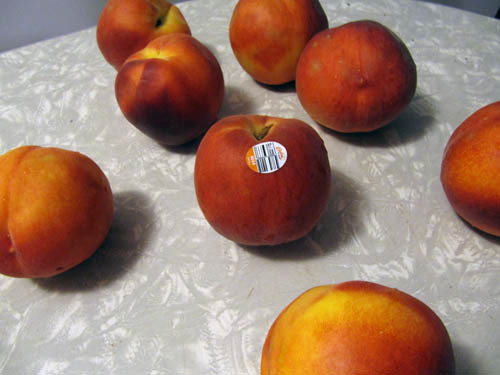 I spent half the time bullying peaches instead of slicing them. And today is my mom’s birthday! So, happy birthday mom! Thanks for helping me work through my fear of the double crust pie. 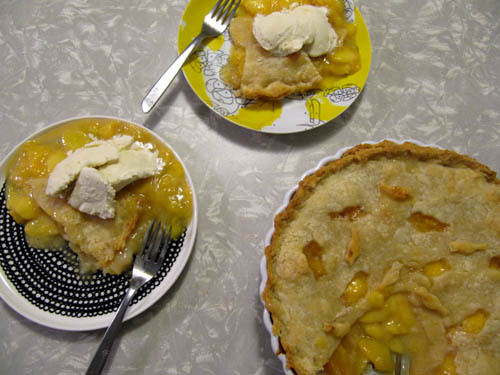 * Just use 3 tablespoons of flour for a pie using only 5 cups peaches. Up it to 4 tablespoons of flour if you use 8 cups of peaches. Preheat the oven to 400°F. Combine sugar, flour, cinnamon, and salt in a large bowl. 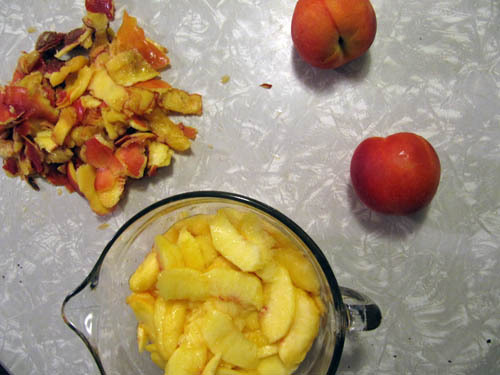 Pour the peaches over the dry ingredients and toss to mix. Add the lemon juice and almond extract. Stir once more and set aside. Roll out a little more than half of the crust into a 10-11 inch circle. Fold rolled dough in half and gently ease it into the pie pan with fold in center. Unfold and fit into pan, using care not to stretch the dough. Gently press out air pockets with fingertips. Make certain there are no openings for the juice to escape. 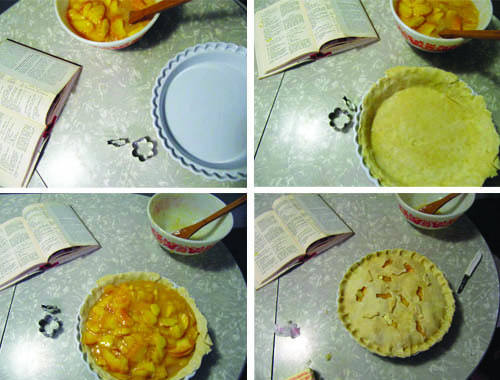 Pour peach filling into the pastry-lined 9″ pie pan. Dot with the two tablespoons of butter. 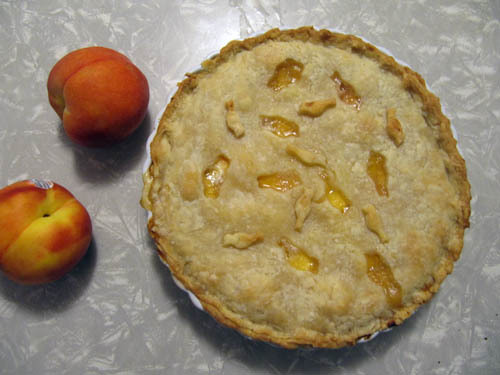 Place pie on a baking sheet (to catch the peach juice that could escape) and into the oven. Bake for 40 minutes, tenting with foil half-way through bake time. Remove from the oven and promptly “ooooh” and “ahh” over how pretty it will be. Top with vanilla ice cream while the pie is still warm, so it melts just enough. Combine flour and salt in a mixing bowl. Cut in butter using a pastry blender or 2 forks until mixture is the consistency of coarse cornmeal or tiny peas. Sprinkle cold water over dry mixture 1 tablespoon at a time, tossing mixture lightly and stirring with a fork. Add water each time to the driest part of mixture. Continue stirring with a fork. The dough should be just moist enough to hold together when pressed gently with a fork. It should not be sticky. Shape dough into a disk and wrap in plastic wrap. Refrigerate for 30 minutes to an hour. It was warm when we sliced it, so the peaches had a mind of their own. P.S. To be honest, after a day in the fridge the peaches still have a mind of their own, but they are just so darn delicious that I don’t mind a bit. So, the filling is only thickened with flour? I know that cornstarch needs to get to 140 degrees to properly thicken. I wonder how the thickening powers of flour are activated. Time to check Harold McGee! Yeah! It’s only thickened with flour, and it didn’t really thicken that much, which has to do with the juicy peaches and that we used way extra. If you want to make it, maybe add some cornstarch to get the perfect slice. mmmmm……I love love love peach pie!!! That looks pretty much heavenly…I can almost taste it. Yummo! 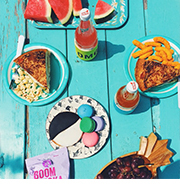 I love that you guys put in extra peaches too…makes sense to me! The more peaches the better, right? What a lovely looking pie! I’ve never bothered taking the skin off of the peaches whenever I bake it. I’m happy you took your leap into double crust pies. I love peach pie with a strusel top instead of a top crust. The crumbly crunch just takes the pie over the top! Hey Dana! I too am a streusel-topping kinda girl, but I couldn’t resist going for it double-crust style for summer’s sake. 🙂 Now I’m hungry for something crumbly. I made this last night and impatiently cut into it about 15 minutes after it came out of the oven so of course it glooped and glopped everywhere. This morning when I sliced a breakfast piece it was perfect so I think flour as a thickener is just fine so long as you’re patient. Thanks for the recipe!! Cool Carol! It’s really hard to be patient about pie, isn’t it? 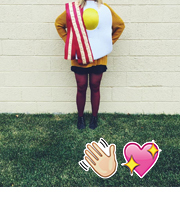 I’m so glad you had breakfast pie and that it sliced like a dream.